1. Preheat the grill to high. Toss the mushrooms with 1 tbsp olive oil and the coriander seeds. Grill for 2-3 minutes, then add the tomatoes and grill for 3 minutes until the skins have just burst. 2. Mix the chilli with the remaining oil. Over a high heat, fry half the chilli oil with the garlic for 1 minute. Add the kale and fry for 2 minutes more. Lower the heat, cover and cook for 10 minutes, stirring occasionally, until tender. 3. 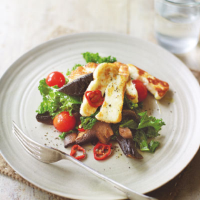 Grill the halloumi for 1-2 minutes on each side. Toss the vegetables with the lemon juice; season and serve with the cheese and a drizzle of the remaining chilli oil.